The state map of Iowa provides a vivid illustration of the exact geographical location and relief features of the state. The State of Iowa is situated to the west of the Mississippi River, in the Midwestern part of the United States of America. The total land area of Iowa is 55,965 square miles, the total inland water area of the state is 310 square miles, making for a total area of 56,275 sq mi. Iowa has an excellent network of roads. Interstate 29 and Interstate 35 are the major highways that join the northern and the southern part of Iowa. The eastern part of Iowa is accessible to the western part of the state by Interstates 80 and 380. 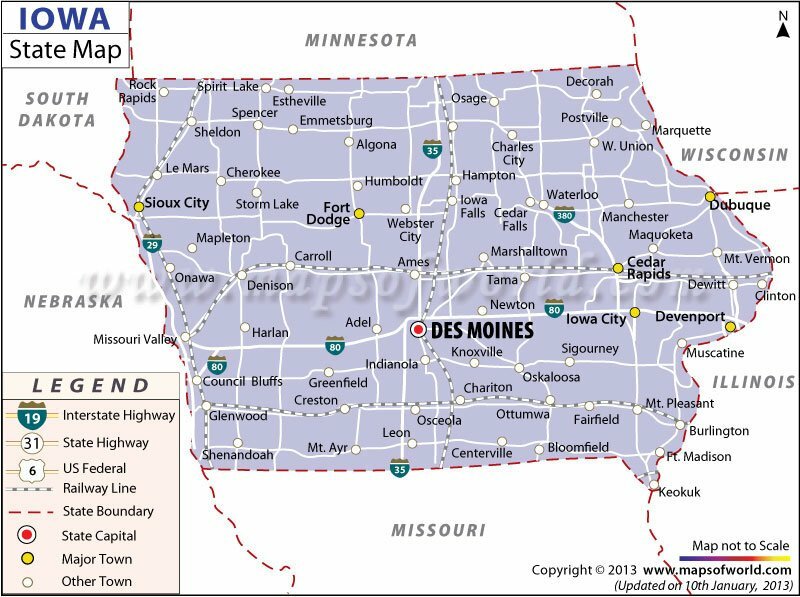 Des Moines is the capital of Iowa. Some of the prominent towns within Iowa include: Fort Dodge, Dubuque, Cedar Rapids, and Davenport. Several rivers flow through the State of Iowa. The Missouri River, Des Moines River, Iowa River, and Cedar River are few of the notable rivers of Iowa.